Ginger Garlic Paste is an essential in any Indian and Asian kitchen. You add a spoonful of ginger garlic paste to curries, stir fries or you use it as a natural tendering agent to meat cuts. 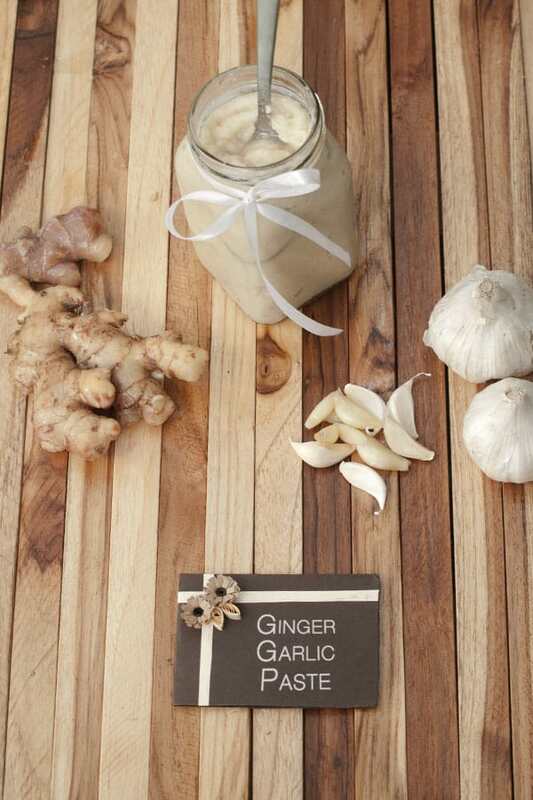 Learn how to make ginger garlic paste at home with the step by step recipe below. What is ginger garlic paste and its use? Some of you were so kind to direct my attention towards a homemade ginger garlic paste. I understand that ready made ginger garlic pastes are not always available in Western stores. 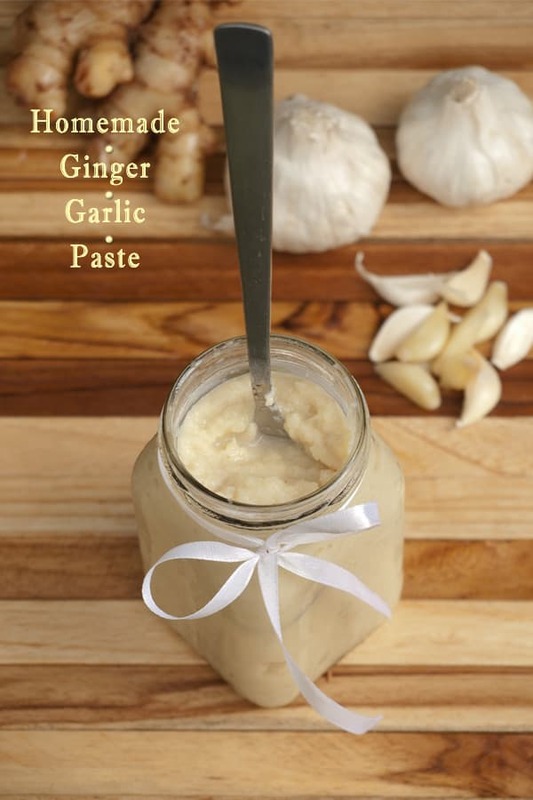 The only option is to make your own from scratch ginger garlic paste. Of course the homemade fresh paste version is stuffed with handpicked aromatic ingredients, so it makes sense to roll up the sleeves and to make your own at home. 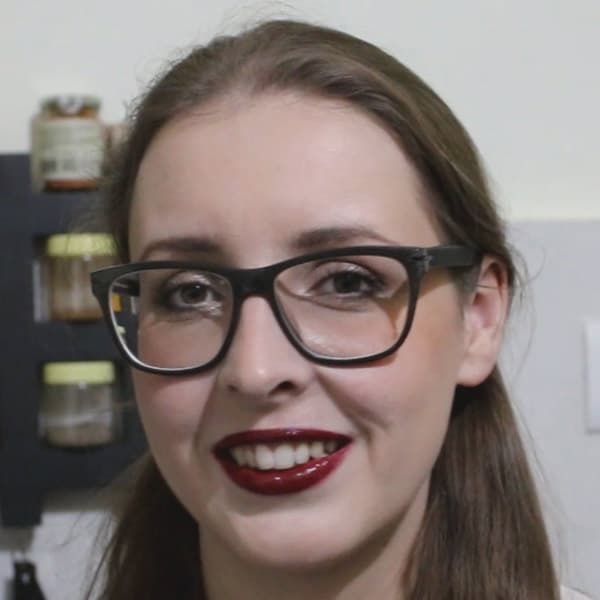 Not only does the paste enhance the flavor of any dish but it also has a super useful meat tenderizing ability which makes it indispensable in my kitchen! Ginger Garlic paste is the most important basic food item in any Indian kitchen. Everybody has it and everybody mostly makes it from scratch. At first, I would only use the aromatic fresh paste in Indian dishes but slowly it found it’s way in home cooked fusion dishes as well. Back in our Tandoori days, I was the ginger garlic maker. We would make big batches by grinding peeled ginger chunks and peeled fresh garlic pods into a fine paste. A kilogram would maybe last for a week. At your local grocer you can buy peeled garlic in bags. There is a great choice of garlic and fresh ginger in the markets. I tend to buy local garlic since it’s very flavorful. When you make this ginger garlic paste, get super fresh young ginger. Just poke with your nail into the ginger and if some root juice comes out, you will know that the ginger is right. Ginger has a tendency to turn fibrous the older it gets. So older ginger roots turn dry and woody and those should not be blend into a paste or you ll end up with irritating strings. The fresher the ginger the better, no doubt! Since it’s not a very common paste in the Western world, I can imagine that homemade ginger garlic paste would make a nice attentive and useful little homemade gift for Asian food loving family members and friends. The version I am sharing today can be stored for a few weeks in the fridge without that it turns bad. Ginger and garlic are anyway known as effective natural food preservatives and I add some organic local coconut vinegar so that it stores even better and longer. You can always use some regular white vinegar in this recipe instead of the coconut vinegar. I use coconut vinegar because it’s a local product in Goa and I love the intensive flavors. My husband’s family and our former Punjabi cook follow the same ginger garlic ratio. That means the ginger is a third to the garlic, less then most other Indian ginger garlic paste recipes. You can always double the amount to make a bigger batch. I often prefer bigger batches since I use it frequently in my cooking and I just like to have enough paste for a few weeks. Rich and flavorful homemade ginger garlic paste for your Asian dishes. Peel your garlic and ginger. Cut your ginger into chunks. Blend the garlic, ginger and vinegar to a fine paste. When doing so you might want to work in batches or your mixer will get over loaded. Do not add any water because that will reduce the shelf life of the paste. Store the smooth paste in a jar and keep in the fridge for further use. Dear reader, how are you planning to use the ginger garlic paste? Really good recipe! I made ginger garlic paste in small quantities whenever I need it. I really should make a big batch sometime – it’s such delicious stuff. Really good post – thanks. You are amazing for sharing this essential staple of almost every Indian and especially Goan kitchen! I make this all the time, and never thought of blogging about it!! Brilliant! You always give me such awesome ideas about things I can write about. Helene, a beautiful post and so informative. 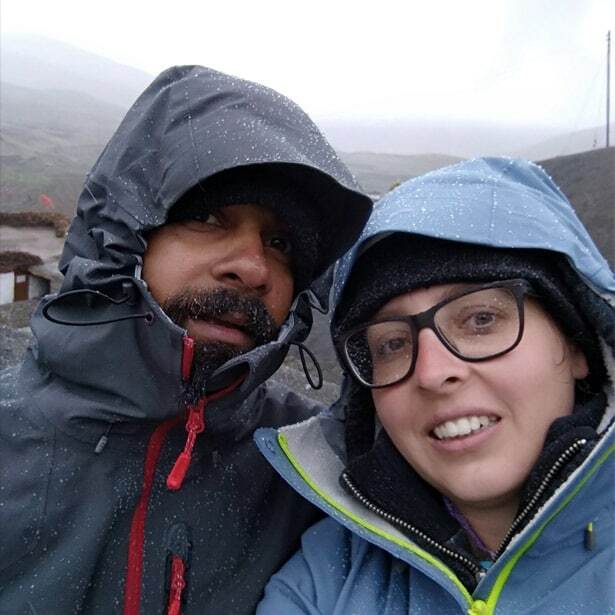 Your pictures are awe inspiring too! Cannot imagine cooking without this! And yours is such an easy recipe 🙂 ! G’day Helen, I have bookmarked this, true! I have never used coconut vinegar before and now am on the search for it too…thank you for allowing me today to learn something new! I love, love this flavor combination, Helene! What an excellent timesaver to have this paste on hand 🙂 Hope you’re enjoying your weekend. Thanks a lot! It was great therefore easy to create. I love ginger-garlic paste! It’s such a convenience and it is so good in many different dishes. Great jar of paste! It looks really nice – do you know how long it will keep for? I’m always looking for healthy, minimally processed ways to add flavor to my dishes, and this sounds fantastic! I actually featured your post on my blog’s Weekend Wrap-Up today, and hope you’ll stop by to check it out. Thanks for such a wonderful idea, and enjoy your weekend! how long can you store the paste in the fridge? I think you can store ginger garlic paste for up to 3 months in the fridge as long as you don’t add water. If you feel that the recipe quantity is too much, half the recipe, that means 125 grams peeled garlic, 40 grams peeled ginger and 34 milliliter white vinegar. Hi Helene, I don’t cook Indian very often so this paste may not last for me. Have you ever tried freezing it? I often freeze this type of thing in an ice cube tray and then pop them out into a ziplock baggie for future use. Eva I am not sure if it makes sense to freeze ginger garlic paste. I tried freezing ginger and garlic in a whole at separate times and I didn’t like the consistency and color it was taking after it thawed. However, I do like your ice cube freezing idea, it sounds convenient and I might just try it myself. Let me know if you tried to freeze the ginger garlic paste this way, I am sure some of us would be interested in the outcome. Don’t defrost the ginger tubor, just grate it on a microplane, you needn’t even peel it. This is how I store ginger as I don’t use it as often. cool idea! I would like to try that sometimes. I can imagine those ginger flakes for tea making. How long can we preserve garlic-ginger paste prepared by this method.Can we use synthetic vinegar? so good and essential in Indian cuisine I should make my own. I just made this with rice vinegar and it’s great, and smells divine! Thanks for the recipe. I read on another site that adding vodka to the ginger garlic paste would preserve it and doesn’t change the flavor profile. Just another idea for consideration. 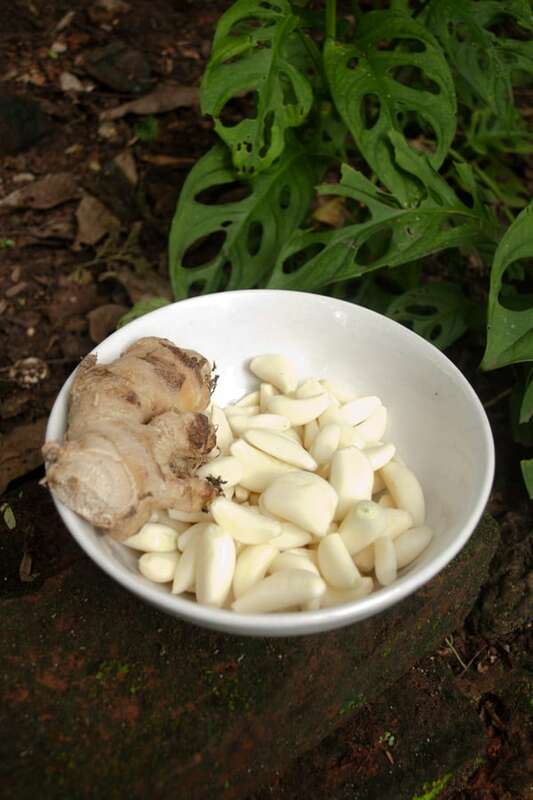 Hi, this may be interesting you: Homemade Ginger Garlic Paste - How to make Ginger Garlic Paste!